A 95-year-old retired doctor is continuing to warn of possible health dangers to residents near the Fukushima No. 1 nuclear plant after some of them developed symptoms similar to those afflicting atomic-bomb survivors he treated for decades. More than a year after the nuclear crisis erupted, Shuntaro Hida is busy giving lectures and interviews to make people aware of the danger of inhaling, drinking or eating radioactive substances. Hida says he has received calls from residents around the Fukushima plant complaining of unexplained fatigue and diarrhea as well as hair loss, symptoms he suspects were caused by internal exposure to radiation. It remains unknown if the health problems are linked to the release of massive amounts of radioactive materials from Tepco's damaged plant. But Hida is concerned. "I am worried because I received such calls much earlier than I expected," he says. The amount of research into and public knowledge about internal exposure to radiation is still limited because the United States "concealed" information about the problem for a long time after it dropped the atomic bombs on Hiroshima and Nagasaki in 1945, Hida says. 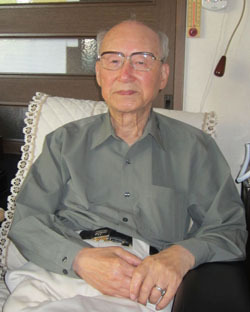 A native of Hiroshima, he was serving as an army doctor there when he was exposed to radiation from the atomic bomb. He has since treated more than 6,000 survivors and worked as a director of the counseling center at the Japan Confederation of A- and H-Bomb Sufferers Organizations. Once radiation gets into the human body, it leads to long-term exposure to low-dose radiation, he says. That could pose a greater risk to human health, such as developing cancer and damaging the immune system, than short-term exposure to a higher level of radiation. Hida says that through his endeavors to share his experiences with younger generations, he has come to feel that many people in Japan now see rejecting not only nuclear weapons but also nuclear power as "the only way" to avoid the threat of radiation. "It is crucial to involve people who are still indifferent as well as those who have not taken any action in the movement to end nuclear power generation," says Hida, who retired in 2009 and now lives in Saitama. He has spent much of his life researching the unexplained fatigue called Bura Bura disease he believes is caused by radiation exposure. Hida says some people could begin showing symptoms "in one to three years" after the Fukushima meltdowns. The illness haunted thousands of atomic-bomb survivors, including those who escaped the direct blast but inhaled, drank or ate radioactive substances, he says. Those who exhibited the symptoms felt too tired to work or even stand up, but doctors could not clearly establish they were ill. The patients lost trust in society as they were regarded by some as pretending to be sick or were just being lazy. "Many of them committed suicide," Hida says. He is worried that something similar might be repeated in Fukushima because current medicine still can't establish a link between fatigue and radiation exposure. "It is a fight to change the mindset of each and every person," Hida says, recalling his decades-long struggles to make people aware of the danger of internal exposure to radiation amid a lack of scientific data. Under the Occupation until the early 1950s, people were forbidden from "speaking, recording or doing research into symptoms of atomic-bomb survivors," he says. "I was stalked by the military police when I was talking about what I witnessed in Hiroshima," and arrested several times by the Occupation forces for "not abiding by their Occupation policy." Hida, as a representative of a group of medical professionals called the Japan Federation of Democratic Medical Institutions, urged U.N. Secretary General U Thant in 1975 to hold an international conference on the effects of radiation on hibakusha, which was realized two years later. "It's anger that has kept me speaking to this day. How could I remain silent even 67 years after the bombings?" Hida says. We say "kampai!" to some of the best places in Tokyo to drink the foam-topped thirst-quencher.